When I look at a loon, I see a bird who carries the endless possibilities of the true potential we each carry inside of us. The white dots are symbolic of the stars in the Universe. Going on forever. The black lines are always flowing and never ending. The red eye is usually the only color I use when painting loons. It represents life. The black dot in the center of the eye represents us. Sitting in the middle of possibilities and all we have to do is "Dare to Dream". 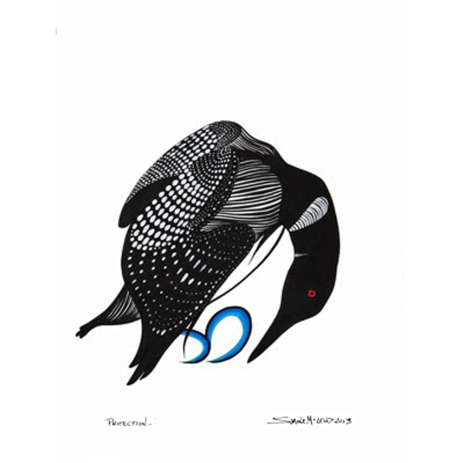 This loon was done primarily with the black lines and the white dots representing the Universe which I do when painting these beautiful birds. I honored my deceased brother Christopher "Stanley" DuBois by painting the eggs (a symbol of new beginnings) with the flowing colored lines in which he loved to paint with.